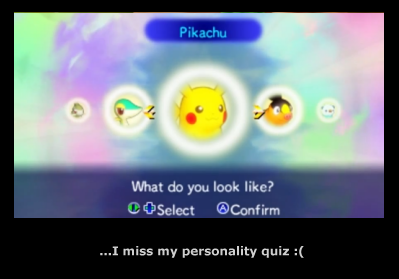 Unlike previous games in the series, you do not start off with a personality quiz. In fact, you get to choose who you look like…out of 5 Pokemon: Pikachu, Oshawott, Snivy, Tepig, and Axew. For those who disliked being forced to be a specific gender in order to be certain Pokemon, you will be happy to know that this is not the case and the game doesn’t even ask for your gender…however, with so few choices, I’m not sure how they could restrict it much even if it did. After choosing yourself, you get to pick who will be your partner out of the remaining four Pokemon. And don’t worry, while your partner is referred to as male, the player character’s gender is never mentioned–you are pretty much always referenced by name. The general gameplay with dungeons has not changed too much. There aren’t any special tiles only certain Pokemon can go over (with the exception of some gaps for Flying Pokemon), although, there is a scarf that lets you do so. There are several new scarves and orbs as well as a brand new Team attack that lets all 4 of your Pokemon attack everyone in the room. Not to mention your attacks will actually level-up upon use (and for that attack in general–not just for the specific Pokemon using it). The limit in a team is still four, but at the very least, you can recruit Pokemon regardless if your team is full (you just need to select who will go back). 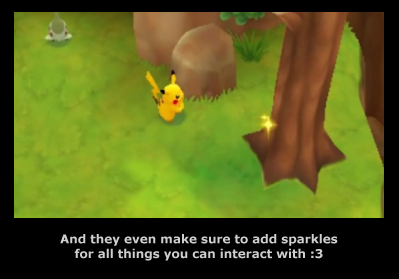 There also are sparkles which hold “hidden” items (or sometimes even Pokemon)–they are blue though which can cause them to sometimes blend in with the map. The biggest changes with dungeons though are the removal of apples in most dungeons as Hunger is no longer an issue except in some optional dungeons (Apples do appear where hunger is featured) and that now they will sometimes have parts that take place outside–usually with things you need to interact with and/or multiple tunnels you need to take to get to the next area. Post-game, there are also mysterious happenings that can happen–numbered 1-5 on a request depending on how many could happen and how high the chance. The effects vary, but some examples are enemies becoming weaker and not being able to heal HP. When in a dungeon with a mysterious happening, you also have a chance to find special rooms (Like a Golden Room) that can last for multiple floors and may have its own special properties (like only corridors) that can hold special Pokemon and items. There are also Detours which are essentially areas of the dungeon that are locked by something only a specific type of Pokemon can open (IE: Vines = Grass Pokemon), need to be paid to open, and/or a colored door that can only be opened by a key of a matching color. These detours will always be on the same floor and in the same place. Inside the detour are prizes along with much stronger enemies (At least 20-50 levels above everything else in the dungeon). The gates do reset when exiting the dungeon or switching floors, so don’t waste your key if you aren’t ready. The gates are always on the same floor of a dungeon and you can even build a shop in Paradise where the Pokemon working there can alert you if there is a detour on the floor you are on. Monster Houses also make a return and are just as cruel as always. One of the important things to note is that when you accept a request from the board, a gate is opened that you go through in order to take care of the request. You do not go to the main path and pick from there–while it makes it quicker to go to the right one, it also means you won’t spend as much time going on the main path. In fact, the only reason to is for story quests, DLC, and/or if you want to explore a cave without a request at all. As for grinding, I recommend doing it while you can. The game tends to be pretty restrictive on when you can do what–sometimes you may only be allowed to do requests while other times, all you can do is shop before continuing with the story. So, if you have time to choose what you’d like to do, I’d recommend using it as there is very little flexibility with it and could cost you near the end of the story. Also do your best to get Team Skills–they are fairly rare, only appearing in chests (they have a higher chance of being found in black chests). I, personally, did not have luck with them at all through the entire story. They replace the series’ previous IQ system. It works pretty much the same way, although, they are earned a lot differently and now effect your entire team over just the specific Pokemon that earned them. While it’s nice that they effect your entire team now, I find it’s much harder to earn/get due to their rarity. Besides the usual Dungeon grinding, you have your own Paradise which is kind of like another town. 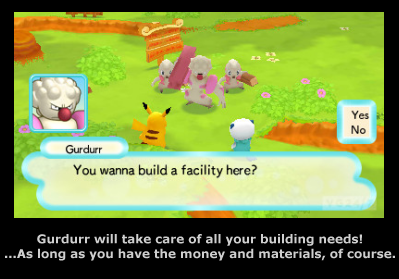 In order to get buildings made, you need to get supplies for your carpenter, Gurdurr. Supplies are gotten from taking requests from the bulletin board–not much different from the older games. Unfortunately, there is a catch…you are no longer able to chain requests. All requests have to be done one at a time which makes this system much more tedious than it needs to be. You also can’t upgrade buildings or expand area until you have built a certain amount which can make it a bit more restrictive than you may want it to be. Not to mention the amount of areas you have is what determines how many Pokemon you can recruit. On top of that, you will need to earn 20,000 Paradise Points (and of course, beat the game) to even unlock all the different facilities you can build. The facilities range from plots where you can plant berries and seeds to get more in return to various shops and minigames so they are definitely worth working on. One of the buildings you do not need to make is Victini’s with the V-Wheel. Due to a new feature that involves Victini’s V-Wave, you can use the V-Wheel (paying for a higher chance) to try and change which Pokemon type has the advantage. It changes everyday and not only will the type’s be stronger that day, but they also won’t use any PP. 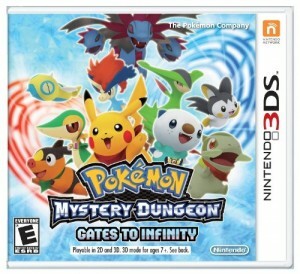 This effects all monsters in the dungeon so if you’re an electric-type Pokemon, chances are you do not want to go into a dungeon with mostly Ground Pokemon–especially on a day where Ground is the V-Wave type. Of course, this works both ways, so if you have a team featuring a type that is picked, it’ll be a helpful advantage in a dungeon you go to. Due to the fact that you can have shops built in Paradise, that makes Post Town–the usual main hub–more of a secondary stop. Unless you really want to see if they have something different, there’s a lot less reasons to go. I found myself only really going to open chests or exchange some things and more often than not, I’d even forget since it was out of the way. Despite this, there are some neat shops–including the Gold Bar Exchange/sales which lets you trade Gold Bars for either money or items and the Gift Shop which allows you to give certain items to make into a gift which you can give to a specific Pokemon or Type to make it more likely to join your team. Some of the bigger new additions are the Magnagates and Companion Mode. The Magnagates are special dungeons that can be gotten to by looking at a circle (whether it be the top of a cup or a circle in paint does not matter). These give you a random pair of Pokemon and are not only very long, but quite difficult. If you plan to do them, definitely make sure you have time and do some grinding on each floor as well. Because of their difficulty though, not only do you get to keep all the items you find in the dungeon, but you also get a bunch of prizes upon completion. Companion Mode is similar as you get to go off on other things with any Pokemon that are not in your main team. You can also only play Wireless missions in Companion Mode. Your Pokemon do gain experience regardless of if you are using them though, so unless you really want to play as other Pokemon or are looking to do Wireless mode, Companion Mode isn’t really as needed. There is also a special bulletin board that lets you know of special Mystery Dungeons and is also the one to tell you about dungeons with Legendary Pokemon. 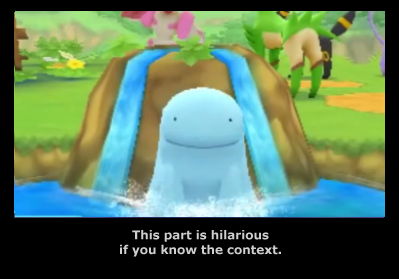 The game seems to be a bit simpler with a bit less choices and complexity, however, this also causes the game to feel much more limited as well–even pointing out, usually loudly, when there’s a boss or a wanted Pokemon. That isn’t to say it’s too easy, after all, detours will kill you easily if you are unprepared and some puzzles require quite a bit of thinking–guessing randomly won’t get you anywhere. It’s more of the game just having a lot less. In fact, Gates to Infinity actually features the least amount of Pokemon you can recruit with only 151–that’s less than half of what the first games in the series allowed. Regardless, the game does have many different dungeons including ones available through Downloadable Content which is where most of the replay value is–well, that and I suppose getting your Paradise Rank up. Finally, Street Pass is featured in two ways. The first is just by passing others–the more you do so, the higher the chance of getting special items. The second is by putting Revival Seeds into the special post box. If you pass someone’s team that was defeated, they will get the Revival Seed to continue their game and you will receive something in return. Revival Seeds do seem a bit more common in this game (further making the game feel a bit more simple), possibly due to the Street Pass feature and both are pretty neat so I hope many people will use them. Gates to Infinity also happens to feature the smallest amount of chapters. However, while the first ones are fairly short, the latter ones are quite long–especially with continuous dungeons and not many areas to save. As per usual, you will have a weird dream, wake up as a Pokemon, and be found by your partner Pokemon and learn of their dreams in life. This time, it’s to create a Paradise and go on adventures. You will also get to learn the basis of the story: Pokemon have become utter jerks for reasons unknown–later implied and confirmed due to losing hope in the world. So, while your partner is working on the paradise, your job is to save the Pokemon World and restore hope and trust in the community, which more often than not, your partner seems to be doing a better job at. Yours and your partner’s friendship, among a few other people’s friendships, do slowly convince people to join you in your journey as you try to reunite Pokemon and give them their hope back along with your final mission. The story this time around starts out as a very light tone and then takes quite a dark twist and regardless of which part you are in, there’s both tearjerker moments and humor mixed in as always. Parts of the story did remind me of previous games and it does have the “several dungeons at once where you can’t return to town” chapters, but I would say the biggest flaw is the space inbetween some of the earlier chapters is bigger than usual–of course, this could just be due to some of the changes in how adventuring works this time around (along with less flexibility at times–especially in the latter half of the game). Another idea is that they may just be big due to how few there are later on–in fact, sometimes you won’t get a break at all. The story also has its usual plot twists and tendency to rank up difficulty when it comes to bosses, which probably isn’t a surprise by now. In the end, your player character does go back, but once more you can get them to return in the post game–however, it is not immediate and actually requires you to do some stuff as the partner you chose first. At the very least, I will say this game’s plot twist is as big, if not a bit bigger, than the last game. This is also the first time the series breaks the 4th wall. The story also gives a little more backstory to your Partner than previous games have. Besides your journey, you also help others complete their own dreams and overall, the story is spreading friendship and hope to save the world. I would like to point out that there is one thing that made me wonder. The Pokemon were said to lose faith/hope due to the Rainbows of Hope no longer showing up because of the creation of the Bittercold. However, the Bittercold is made through all of those negative feelings in the first place. Obviously, since the Rainbows are only supposed to be able to be seen from Post Town, there is a chance that Pokemon were just being negative elsewhere to the point where it finally effected Post Town. This does eventually get semi-elaborated on with the mention of other towns, but as for what made them lose hope…that isn’t really given at all. It’s not really a huge deal–especially if you don’t think much about it, but I still felt it was worth mentioning. Finally, while the game does give you a choice on returning at the end, if you pick “no”, it will count as a failure after some sad dialogue and give you a Game Over. You will have to replay the dungeon and will lose items as per usual for “losing”. Because of this, I’m not really sure why they gave a choice to begin with considering unless you pick yes, you will be in an infinite loop of failure. There isn’t much to cover in these sections so I will be merging them a bit. As for art, the Pokemon now have 3D Models and the dungeons are a bit prettier…but when it comes down to it, the art hasn’t changed very much. In fact, you’ll find the talking portraits not be much different than you remember–they do not look out of place though and actually fit in quite nicely. When it comes to the 3D effect itself, it does add a lot of depth to the game and environment so it can be fun to toggle on at times. Most of all though, the 3D allows them to have more action-packed cutscenes which are always fun to watch. The music is great. It always felt in place and really set the mood and it’s definitely worth a listen to regardless if you get the game or not. I tend to keep music off in most games, but I enjoyed having it on to listen to so I always find that a plus. As for customization, you can choose which types of land you want for your Paradise along with what buildings go where and the order you want to build them (depending on what you have unlocked, of course). After a certain amount of buildings, you can also choose colors for facilities as well. You also can eventually change the color of your house too. And like previous games, you can choose the menu colors. 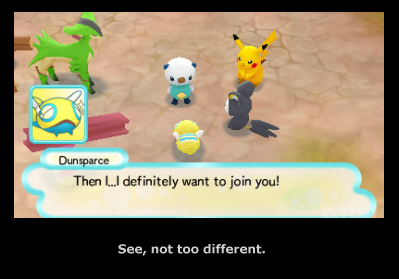 There isn’t much else to it though and with a much less choice for which Pokemon you happen to be, the immersion can feel a bit lacking at first. I really want to like it, but the disappointment reminds me a lot of my disappointment with Animal Crossing: City Folk–the new features are interesting, but the bad greatly outweighs the good which causes the experience to be ruined a lot. The game isn’t as engaging–maybe partially because it doesn’t have that pull that the personality quiz would give you, but also because they have just made it much slower and not in a way to draw out the content, but a way to make it feel like it’s dumbed down. In fact, 2/3 first Pokemon you get will probably be a higher level than you unless you’ve grinded quite a bit…which isn’t even really that necessary until later. And of course when it is necessary, you really won’t get a chance to either. Despite being in a Dungeon where I was still doing a good amount of damage, there are Pokemon that have some really cheap move sets (Lilligant’s comes to mind) along with others that may suddenly be able to one-shot you due to a V-Wave, and no, that Pokemon does not even need to be a type that is super effective. Of course, the game still has some evil points with traps or treasure rooms not being super safe as well, but in general, it just feels like they didn’t try. This game should’ve been one of the biggest and instead, it feels so small and with every new feature, it feels like they made an older feature irrelevant or ruined the new feature by killing an old feature in the first place. There have been some people who think that the game was more of a test for the 3D Models with Pokemon X and Y coming out later this year and that actually could be the case as when it comes down to it, that is honestly a possibility. If you mostly played the series just for the dungeon crawling, I’d say pick it up. If you played for the story, I would say pick it up as well, but keep in mind that the story starts off a lot slower than previous and then it kind of piles up on your in the latter half. If you played for the immersion, then it depends how patient you are as the lack of personality quiz delays it a bit. If you can look over that though, then still give it a shot as the immersion will hit eventually–it just isn’t immediate. Overall, I’d definitely recommend the previous games in the series over this one, but it is still worth a go at the very least to experience some of the new features and see the story for yourself. Personally, despite some issues with the game, the story actually had me quite emotional towards the end and made me glad I played. I think if they didn’t remove some of the nice features from past games, the game would’ve been wonderful–it’s just the stuff they removed that really caused it to be a bit frustrating–especially with the slow beginning and then with such a fast pace at the end and being forced to go ahead (I ended up finishing the game at level 36).